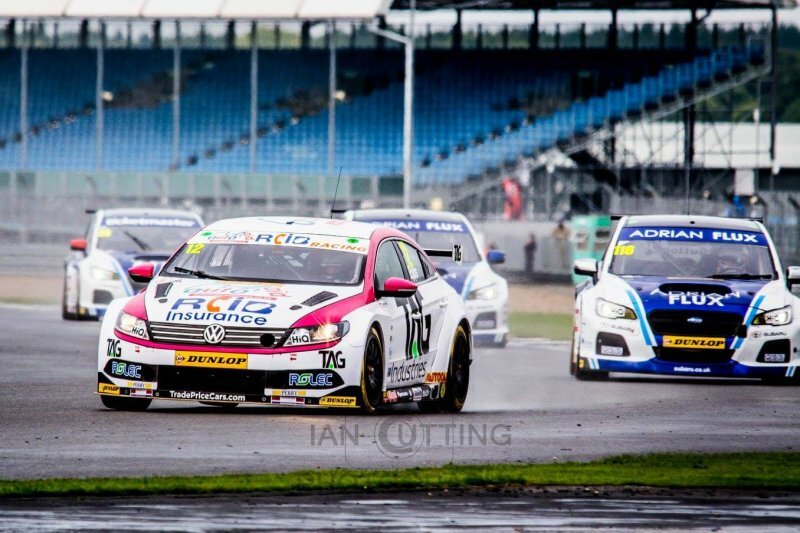 Weekend of the 16th and 17th of September marked the penultimate 2017 BTCC racing stage at the Northamptonshire based Silverstone Circuit. With rounds 25, 26 and 27 complete, only 12 days are now left until the Brand Hatch season finale. Such crucial stage of the championship was unsurprisingly full of twists and turns and some unexpected podium takers, seeing all three rounds being won by three different contenders. Ashley Sutton and Colin Turkington, standing in P1 and P2 with 338 and 328 points respectively, have a ten point difference between each other and still hold the best chances at winning the BTC Championship. However, Silverstone didn’t disappoint when presenting its spectators with a thrilling performance, three superb drivers, Tom Ingram, Jack Goff and Matt Neal managed to take top podium stands. Speedworks Motorsport’s Ingram, who took an early lead over the pole-sitting Goff in the opening lap, was the first P1 taker and claimed his fourth victory of the season. Goff kept good pace throughout and ended the race in second place after an accident led to red flags being raised, ending the encounter prematurely. Adam Morgan, just over 1.7s behind, grabbed an impressive third place finish and completed the first race podium line up. It was a harsh touch between Chris Smiley’s Chevrolet and Aron Taylor-Smith’s MG on the run down to Maggotts on lap 14 that led to a knock-on effect and a pile up behind. Rob Collard was caught up in the scuffle, leading to his BMW sliding uncontrollably across the grass, before returning to the track across the circuit at Becketts. Will Burns had then slammed into Collard’s car, resulting in the race being cut short and the duo being taken to the hospital for precautionary checks. Burns suffered rib injuries, however, was discharged the same day along with Collard. The two drivers did not return to compete in further rounds. Race two saw the Honda Civic Type R driving Goff take the lead from his previous race contender, Ingram, in lap 3, and after an impressive and well-praised performance, finish in first with an almost 5s advantage over the second place winner, Ingram. This was Goff’s first victory for Eurotech Racing. Championship leader Ash Sutton, scraping for a podium win coming up to Race 2’s chequered flags made a move on rival, Team BMW’s Colin Turkington. Turkington moved into defensive mode, as Sutton poked his Subaru down the inside into Luffield, struggling to hang on, he lost his lead allowing Sutton to take P3. However, following a post-race review by the Stewards, Sutton was penalised for the ‘unfair’ move, losing his podium place to Turkington as a result. Due to this being the young driver’s third penalty strike of the season, he was forced to start the round from the back of the grid. Halfords Yuasa Racing’s triple BTCC champion Matt Neal, after some impressive efforts, won the final round, making this his 61st BTCC victory. Power Maxed Racing’s Rob Huff was awarded second place, while BTC Norlin Racing’s Dave Newsham successfully took third. Silverstone arguably left Sutton with the most to celebrate. Second in the championship’s standings, Turkington and his BMW got involved in a melee of someone else’s incident, which ended his weekend on a low point. Shedden who faced trouble early on in the event and missed two races, also struggled to gain points to take him closer to the leader’s position. Although, all is not lost, with 67 points still up for grabs at the Brands Hatch Grand Prix, we are yet to find out who the clear podium winners will be! Rounds 28, 29 and 30 of the 2017 Dunlop MSA British Touring Car Championship will take place at Brands Hatch on 30 September/1 October. Be sure to tune into ITV4 for live viewing.